Your company is only one half of an important relationship that creates the ecosystem of business. The other half of that equation is your customers, who are essential to your success. We all know that the best companies–the ones that thrive no matter the economic weather–are those who are tightly connected to their customers. This means that they communicate effectively in both directions, and that they’re answering a need in their community. But how can you become one of those businesses? Well, a good place to start is with a customer survey. A survey can help us get a read on how our interaction with customers is doing. It allows us to be aware of and address any glaring problems. It lets customers know that we care about them. It can help us to know what the result will be if we change directions a little bit, or even if we start to expand our services. Beware leading questions. Used judiciously, focused questions can help you to gather data that you can easily process and present. However, most customers prefer enough flexibility to really share their views, rather than being funneled into “yes” or “no” answers. Avoid limitations on answers. As stated above, it can be frustrating for customers to be boxed into incomplete responses. If you’re ready to actually open up your ears then you need to be flexible enough to allow for answers that won’t fit into the neat categories that you anticipated. Be ready to learn something new from your customers. Have room for them to answer “none of the above” and enter their own open-ended answers. Keep it short. Don’t ever make your customers regret saying “yes” to filling out a survey. Let them know exactly how long it will take, and then keep it brief. Ask a few questions that are the most important to you, and then leave enough open-endedness for them to add as much or as little of their own comments as they want. Remember that they’re doing you a favor by taking time to evaluate and communicate their feelings regarding their interactions with you. Focus on your goals. 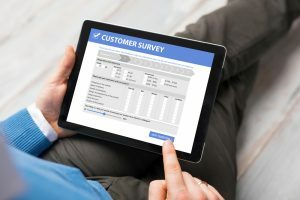 While many of the tips above repeat the need to leave things open-ended, most of the time it’s important to also have a specific goal from your customer survey. There are so many things that can be said about your services, you want to help your customers focus on just one or two aspects. For example, you might want to know how effective your delivery service is, and so you’d want to ask if shoppers found the delivery price fair, if things were received in good shape, etc. Or, you might be looking to expand your services, and so you’ll want to get responses from current customers about which of 4 possible services they would find the most helpful.